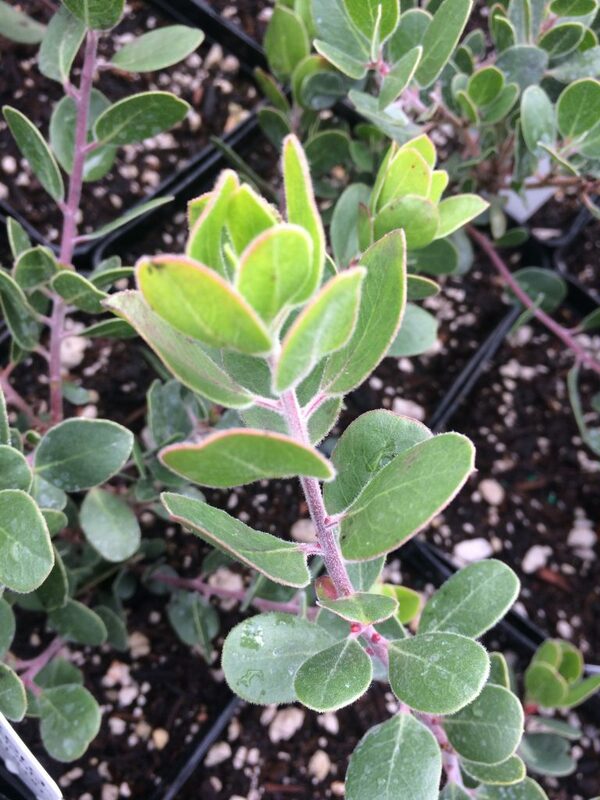 This little known species of Manzanita from the central California coast has turned out to be a great garden plant. Nearly round leaves cling to the winding upward pointing stems. In a short amount of time it forms a rounded, spreading shrub to 3′ tall by 5′ wide (5 years). Late winter bring profuse white urn shaped flowers- seems not to form berries as frequently in our climate. Full sun and average, well drained soil with good air circulation. No summer water at all when established. This not only gives it the neglect it adores it increases hardiness to cold in winter. Avoid, exposure to subfreezing winds… not a Manzanita for Gresham or Troutdale but in milder parts a great landscape shrub. Group with other drought adapted shrubs. Handsome smaller scale shrub for hot sunny sites. Develops shredded cinnamon red bark with time.